Description Bronze medallion, signed "H.Weir.Del"
Brief History Commissioned by J.S.& A.B Wyon, Sealmakers to H.M.Queen Victoria for the Govt. of India Horse Show. Minted in Calcutta. What is generally not known about Harrison Weir, is that apart from his ability as an illustrator for both the Popular Press and for the many publishers of Children's Books and books on Natural History, his expertise as an artist/designer on all things to do with wildlife, or animals or birds in general, was constantly sought after by those involved in manufacturing, who wished to include animal designs in their work. This included the Silversmiths 'Garrards of London' who, among others, were involved in the design and manufacture of the principal racing trophies for Ascot and other famous horse racing events of the era. It also included the official seal-makers to the Queen, Messrs J.S and A.B. Wyon, whose medallions and seals were used widely throughout the commonwealth. Harrison was indeed no stranger to horses. His first wife, Anne Herring, was the daughter of one the most famous painters of horses in the United Kingdom, John Frederick Herring. Herring's work, through the initial patronage of the Duchess of Kent, ultimately also brought him to the honoured position of direct patronage from Her Majesty the Queen. Through his connection to the Herring family, Harrison was exposed to a regular diet of horse racing events, race news reporting, illustrating and equestrian eventing. John Herring Senior's sons, John (Jr) and Charles Herring and youngest son, Benjamin Herring, were all noted horse illustrators of the 19th century. The younger brother-in-law of Harrison Weir, Benjamin, also gained valuable knowledge of the illustrating craft under the direct influence of Harrison, while simultaneously engaged on the staff of The Illustrated London News, on a number of projects with Weir. On this occasion, J.S. and A.B. 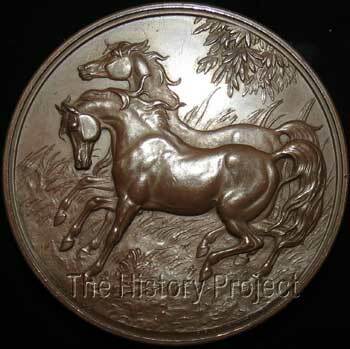 Wyon commissioned Harrison Weir to design a medallion to be used in conjunction with the Government of India Horse Show, circa 1862. 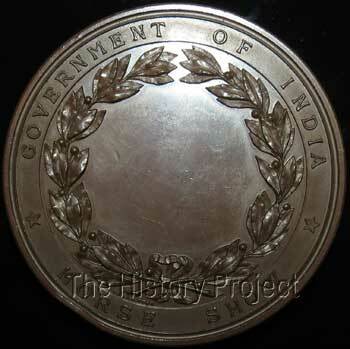 The medallion was modelled in England but minted in Calcutta, India. It was produced in Gold, Silver and Bronze. Now very rare, we managed to track only a few silver medallions in museums and private collections. When this bronze medallion recently came to market, the writer was engaged in bidding hard to successfully secure it for the Harrison Weir Collection, predominantly for its direct links to its originating designer. The medallion carries the marks of the designer, H. WEIR. DEL, as well as those of the three dimensional engravers, J.B. & J.S. WYON on the front of the medallion rim. These sit directly under the front and rear hooves of the horses.